(Updated 22/06/2016). The first movie in what appears to be growing into a horror franchise really impressed. I was quite late to watching it but so glad I did even though supernatural ghost-story fair usually freaks me out. But director James Wan nailed an old fashioned concept and delivered a truly unnerving and frightening experience. So sitting down to the sequel I was both excited and a bit on edge. Early word had it that this was going to be even scarier … and once again explored a based-on-fact true story this time set in Enfield, England in the late seventies. Paranormal investigators Ed & Lorrain Warren (Patrick Wilson & Vera Farmiga) are called into investigate a series of strange happenings at a family home where the youngest daughter seems to be the focus of a restless entity. As a UK resident this was an immediately relatable and authentic setting for a horror movie. With recognisable east-end cockney accents, along with a street not unlike one I grew up on, I was transported back to my childhood, at least spiritually. However this is a James Wan movie and soon the tension builds and the scares are brought on so we get freaky things going bump in the night, eerie corridors, moving furniture and a ghostly, malevolent old man. It’s effectively creepy and unnerving but not quite as under-your-skin as Conjuring #1, relying a bit too much on jump-scares. A prologue detailing the Warren’s involvement in the infamous Amityville house sets the tone and the involvement of a ghostly, demonic nun definitely disturbs. However with a 2hr+ run time, the encounters do get a bit repetitive, and a boogie-man sequence that plays on childhood fears threatens to turn the movie into something else entirely. Performances however are decent across the board especially the young actress playing tormented child ‘Janet’ (Madison Wolfe), as well as her struggling mother. Yet this is also Wilson & Farmiga’s movie and they again add plenty of emotional weight to proceedings. Wan cranks up the thrills especially towards the end but a bit like the last movie things wrap themselves up too easily. However throughout I was nervously gripped and with the backdrop of a true story in mind this still made for an above average experience. Recommended. 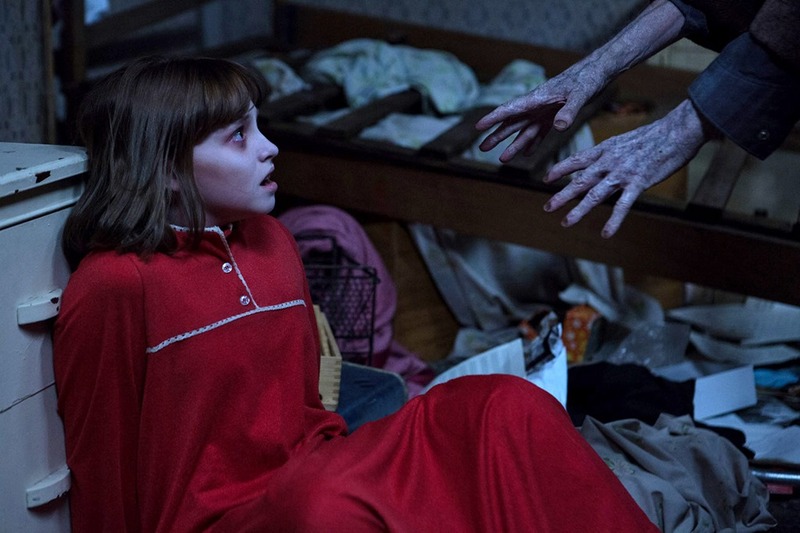 This entry was posted in Cinema, Horror Reviews, Movies, Reviews and tagged Amityville Horror, Enfield Haunting, Ghost Story, James Wan, Madison Wolfe, Patrick Wilson, Poltergeist, Possession, Spirits, supernatural, The Conjuring, The Conjuring 2, Vera Farmiga by Craig M. Bookmark the permalink. Good review. I also thought it was quite unnecessary to drag the movie for 2 hours just for the sake of it. Also, I am still trying to figure out the signing to the guitar right in the middle of the movie – I would have hoped the “ghost” would be signing along at the very least!